China’s share of the global economy has increased rapidly—from about 5 percent in the early 1980s to more than 26 percent today. India’s economy has similarly expanded, from 3 percent of the global economy in the early ’80s to more than 8 percent today. Meanwhile, the percentage shares of the US, UK, Germany, Japan, and other nations are falling fast. The graph above shows the relative share of global GDP represented by selected nations. The time-frame is 1000 AD to 2016. Manufacturing data* similarly shows India and China’s long-term dominance. 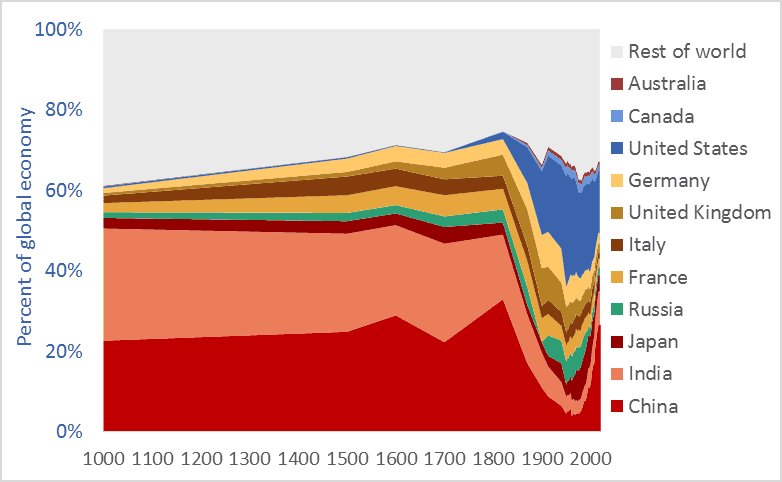 In 1800, fully half the manufacturing output of the world came from India and China. In that year, the UK contributed 4.3 percent of manufacturing output and the US just 0.8 percent. 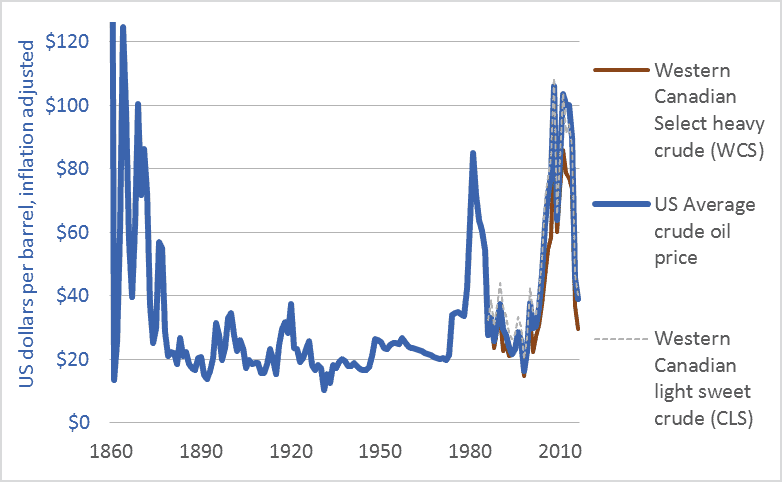 The UK and US came to dominate global manufacturing by the late-1800s, but their rise is recent and, as the graph above suggests, their dominance may be shortlived. Many people have been surprised by the “rise of China” and that of India. No one should be. The global economy is merely returning to its long-term normal—resetting after an anomalous period when European and New World nations were economically ascendant. Indeed, England and Europe have been economic backwaters for 97 percent of the time since civilizations first arose 5,000 years ago. Our educational system fails to teach us that China and India are the default global superpowers. To give just two final examples of the long-term dominance of Asia, China smelted hundreds of thousands of tons of iron in the 11th century using coal rather than wood, a feat not matched in Europe until 600 years later. ** A list of the ten largest cities in the world in the year 1500 includes four in China (Beijing, Nanjing, Hangzhou, and Guangzhou) and two in India (Gaur and Vijayanagara), but just one in Europe, (Paris). The three cities rounding off the top-ten list were Tabriz, Cairo, and Istanbul. *** Clearly, the economic and civilizational centre of gravity was in the East. It appears to be shifting back there. Global freight transport now exceeds 122 trillion tonne-kilometres* per year. That enormous tonnage/distance has more than tripled since the beginning of the “free trade” era, in the 1980s. And the Organization for Economic Cooperation and Development (OECD) projects that global freight transport tonnage will triple again in the coming generation—rising to 330 trillion tonne-kilometres per year by 2050 (see OECD). To put these trillions into perspective, freight movement will soon surpass 100,000 tonne-kilometres per capita per year for those of us living high-consumption lifestyles, here and around the world. *Note: a tonne-kilometre is equivalent to moving one tonne one kilometre. If you move 10 tonnes 10 kilometres, that is 100 tonne-kilometres. A major part of this increase in transport tonnage is related to trade agreements and globalization. As we’ve restructured the global economy we have off-shored our factories. Our washing machines, toasters, rubber boots, TVs, and many of our cars now come from half-way around the world. Our foods and fertilizers are increasingly shipped across continents or oceans. And we ship food, resources, and other goods around the world. Economic growth means we’re consuming more and more; globalization means we’re consuming resources and products from further away. These two trends, together, help explain the tenfold increase in global freight transport depicted in the graph. Moving this colossal tonnage requires ships, trains, trucks, and airplanes—all of which burn fossil fuels and emit greenhouse gas (GHG) emissions. Emissions from the freight transport sector make up about 10 percent of all man-made CO2 emissions (see OECD). The OECD predicts that if current trends and policies hold, emissions will nearly double by 2050, to 5.7 billion tonnes of CO2 per year (see OECD). This near-doubling of freight transport emissions between now and 2050 will occur at the same time that we are attempting to cut overall GHG emissions by half. It is time to ask the obvious questions: Is our ongoing drive toward globalization (i.e., de-localization and transport maximization) compatible with our emission-reduction commitments and a livable climate? Indeed, as our leaders aggressively sign and implement still more “free trade” agreements (TPP, CETA, etc.) we should consider that perhaps doubling down on globalization vetoes emissions reduction, vetoes a stable climate, vetoes local food, and vetoes local jobs. To leave a comment, click on the graph or this post’s title and then scroll down. Graph sources: 2015, 2030, and 2050 data from the OECD/ITF page 56. Data for 2000 and 1985 are from various sources: air freight data is from the World Bank. Rail freight data is from the World Bank. Maritime freight data is from the United Nations, Review of Maritime Transport. Road freight data for 2000 is from the OECD. Road freight data for 1985 is an informed estimate. I will argue that talk of “low oil prices” ignores history, misconstrues energy’s role in making civilizations, and confuses our efforts to build resilient, sustainable, climate-stabilizing economies. The graph above and the table below put recent oil prices into their long-term context. The graph covers the 156-year period from the first large-scale production of petroleum oil to the present: 1860 to 2016. It shows US average crude oil prices and Canadian prices for light sweet crude and heavy tarsands crude. For comparability, all figures are in US dollars and adjusted for inflation. This table helps us interpret the data in the graph by showing average prices for each decade. 1. The graph shows that the very high 2003-2014 prices are an anomaly. 2. The $80 average price in the 2010s is the highest since the 1870s. 3. Even with recent declines, oil prices remain above the levels that held during the century from 1875 to 1975. 4. While prices have averaged $80 in the 2010s, the average price in the 1950s, ’60s, and ’70s was below $30. The greatest period of economic growth in global history, the postwar US boom, was accomplished with very cheap oil. As the cost of oil goes up, the cost of civilization goes up. If energy prices rise too high, we may no longer be able to afford to continue to build or even maintain our sprawling mega-civilization. 6. Western Canadians are particularly sensitive to “low oil prices” because our economy is dependent upon some of the highest-cost oil production systems in the world: the tar sands. We are the high-cost producers. As the International Energy Agency (IEA) said recently, “Attempting to understand how the oil market will look during the next five years is today a task of enormous complexity.” I certainly cannot predict oil prices. And I’m not advocating lower prices. Just the opposite. As someone deeply concerned by climate change, I hope that oil prices rise and stay high, and that governments impose taxes on carbon emissions to push the cost of burning fossil fuels higher still. Nonetheless, we need to dispassionately interpret the data if we are to have any hope of directing our future and our economy. 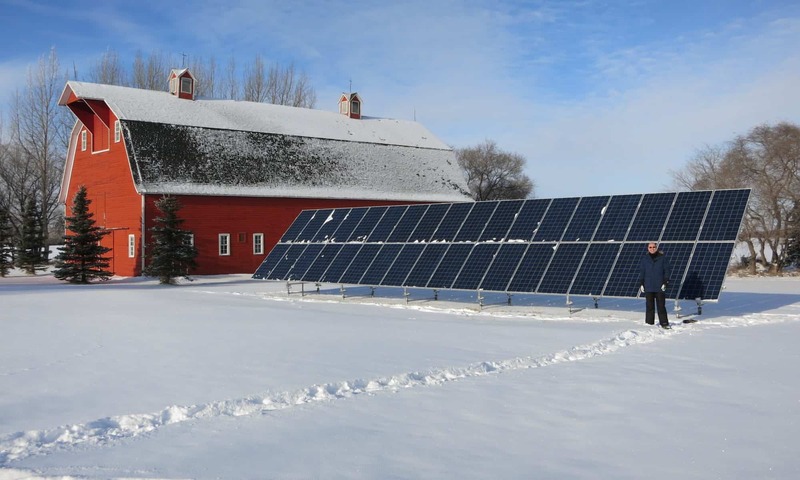 We need to be able to discern when energy prices are low and when they are not. To leave a comment, click on the graph or the title and then scroll down. Canadian net farm income and gross revenue, inflation adjusted, net of government payments, 1926–2016. Canadian net farm income remains low, despite a modest recovery during the past decade. In the graph above, the black, upper line is gross farm revenue. The lower, gray line is realized net farm income. Both measures are adjusted for inflation. And, in both cases, taxpayer-funded farm support payments are subtracted out, to remove the masking effects these payments can otherwise create. The graph shows farmers’ revenues and net incomes from the markets. The green-shaded area highlights periods of positive net farm income; the red-shaded area marks negative net income periods. Most important, however, is the area shaded blue—the area between the gross revenue and net income lines. That area represents farmers’ expenses: the amounts they pay to input manufacturers (Monsanto, Agrium, Deere, Shell, etc.) and service providers (banks, accountants, etc.). Note how the blue area has expanded over time to consume almost all of farmers’ revenues, forcing Canadian net farm income lower and lower. In the 23 years from 1985 to 2007, inclusive, the dominant agribusiness input suppliers and service providers captured 100 percent of Canadian farm revenues—100 percent! During that period, all of farm families’ household incomes had to come from off-farm employment, taxpayer-funded farm-support programs, asset sales and depreciation, and borrowed money. During that time, farmers produced and sold $870 billion worth of farm products, but expenses (i.e., amounts captured by input manufacturers and service providers) consumed the entire amount. Bringing these calculations up to date, in the 32-year period from 1985 to 2016, inclusive, agribusiness corporations captured 98 percent of farmers’ revenues—$1.32 trillion out of $1.35 trillion in revenues. These globally dominant transnational corporations have made themselves the primary beneficiaries of the vast food wealth produced on Canadian farms. These companies have extracted almost all the value in the “value chain.” They have left Canadian taxpayers to backfill farm incomes (approximately $100 billion have been transferred to farmers since 1985). And they have left farmers to borrow the rest (farm debt is at a record high–just under $100 billion). The massive extraction of wealth by some of the world’s most powerful corporations is the cause of an ongoing farm income crisis. This graph shows the global temperature anomaly: how current temperatures compare to latter-twentieth-century “normal” temperatures. Normal, here, is the 1951-1980 average. in looking at the global temperature data, three things are apparent. First, the Earth is already warming. The graph has been trending strongly upward since at least the 1980s. Second, the increase in temperature from the 1951-1980 baseline period will soon reach one degree Celsius. 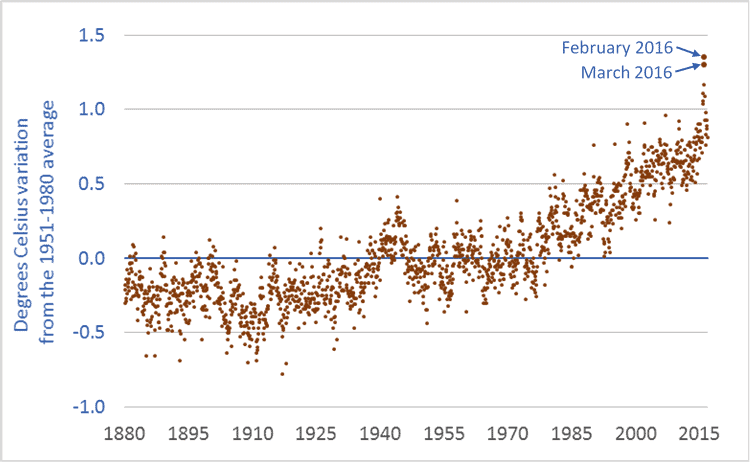 Indeed, temperature outliers such as those in February and March 2016 are approaching 1.5 degrees. Temperatures are rising fast—charting significant increases in decades, not centuries. Third, there is in the data-points a suggestion that the curve may be getting steeper; temperature increases may be accelerating. It’s too early to tell, but given that global temperature increases are lagging well behind atmospheric greenhouse gas (GHG) increases, and given that global emission rates continue to increase, it is prudent to consider that temperature increases may accelerate beyond already-rapid rates. How high might temperatures go? Here’s what we know. In the lead-up to the 2015 Paris climate talks, nearly every nation submitted to the United Nations a commitment to reduce GHG emissions. The United States committed to reduce its emissions by 26 to 28 percent (below 2005 levels) by 2025. Canada committed to reduce emissions by 30 percent by 2030. Other nations made comparable commitments. But the climate models show that even if every nation meets its emission-reduction commitments, our Earth will warm this century by 3.2 degrees Celsius—well beyond the so-called “dangerous” level of 2 degrees C, and more than double the 1.5 degree mark discussed in Paris. Indeed, the graph above makes it clear that 1.5 degrees was always pure fiction. In order to avoid a temperature increase of 3.2 degrees, we must set and meet more ambitious targets. Climate science can be complicated. But at a public policy level—at the levels of citizens and legislators and democratic governance—climate change is simple and clear. It is happening. It is happening fast. And it will devastate our cities, economies, food systems, ecosystems, and perhaps even our civilization unless we act fast. Simple. Graph sources: Combined Land-Surface Air and Sea-Surface Water Temperature Anomalies from National Aeronautics and Space Administration (NASA) Goddard Institute for Space Studies (GISS): GISS Surface Temperature Analysis (GISTEMP). There are lots of graphs related to climate change. Only a few, however, get to the core of the issue. This is one such graph. It shows atmospheric carbon dioxide (CO2) levels over the past 800,000 years—a period four times longer than our species, Homo sapiens, has walked the Earth. The units, parts per million (ppm), will not be familiar to everyone. But the units aren’t important. What is important is the shape of the graph, and the magnitude of current CO2 levels relative to those in the past. As the graph shows, over the past 800,000 years, atmospheric carbon dioxide levels have risen and fallen. Low concentrations correspond to ice ages—eight such periods are visible in the graph. Higher CO2 levels correspond to largely ice-free “interglacial” periods. 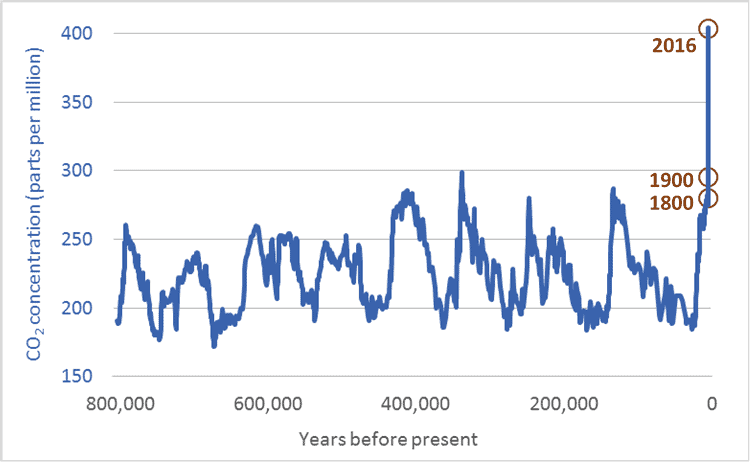 The critical point is this: in the 800,000 years before the modern era, CO2 levels never once rose above 300 ppm. Not once. Now, however, CO2 levels are 405 ppm. And because our emissions continue, it is likely that atmospheric concentrations will increase past 500 ppm, maybe past 600 ppm. Temperature increases are lagging behind CO2 increases. As Earth’s temperatures rise to “catch up” with the rapid increase in CO2, it’s going to get very hot. And it is going to stay hot for a long time. There can be no doubt: humans are the cause of the rapid rise in CO2 levels. No one can look at the graph above and come to any other conclusion. The years 1800 and 1900 are highlighted. The fossil-fuelled industrial and transportation revolutions of the 19th, 20th, and 21st centuries are clearly visible in the graph’s vertical spike—an increase in atmospheric CO2 that has proceeded further and faster than at any other time in the past 800,000 years. CO2 levels have increased by 100 ppm in a century. The data shows that such an increase usually takes 10,000 years. Humans are causing CO2 levels to rise 100 times faster than those levels rose at any time in the past 800 millennia. Even worse, the rate of increase is accelerating; at current and projected emission rates, the next increase of 100 ppm may take just 40 to 60 years. It is impossible to overstate the danger of what we are doing. Words cannot convey how damaging continued CO2-level increases will be to the long-term prospects for human cities, societies, and economies, or to other species and the natural ecosystems we all rely upon. It is as if we have decided to set fire to our home, the Earth. Unless we extinguish that fire, all we hold dear will perish. Currently, we are pouring on gasoline. Note: CO2 measurements for recent decades come directly from air samples. Measurements for past centuries come from analysis of air trapped in bubbles in Antarctic ice. Each ice core is analyzed at multiple research facilities using multiple techniques. Because of this duplicate testing and diversity of sampling methods, there is high confidence among scientists that ice-core data accurately reflects CO2 levels in previous centuries. 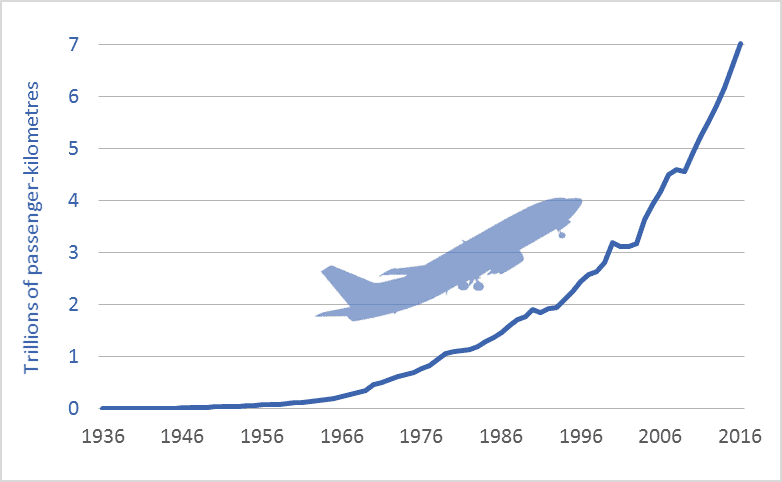 The graph above shows that global air travel is increasing exponentially. In 2016, business travelers, tourists, and others traveled more than 7 trillion passenger-kilometres by air. As you might expect, a passenger-kilometre is equal to moving one person one kilometre. Therefore, if a plane carrying 100 people flies 1,000 kms that is equal to 100,000 passenger-kilometres (pkms). The graph’s shape is significant; it reflects exponential growth: an ever-steeper upward curve. A system that grows exponentially doubles in a constant time-period. The amount of air travel we consume is doubling every 15 years. Thus, over the past 30 years, it has doubled twice, such that pkms were more than 4 times higher in 2016 than in 1986. This exponential increase—this doubling and redoubling—is predicted to continue. Aircraft manufacturer Airbus projects that pkms will double again by 2030 and continue upward (Global Market Forecast 2016). Forecasts by airline industry group International Air Transport Association and Boeing similarly project a doubling in coming years. This projected doubling by 2030 is significant and troubling. In the lead-up to the 2015 Paris climate talks, nearly every nation pledged to reduce greenhouse gas (GHG) emissions. Canada committed to reducing its emissions by 30 percent by 2030. The United States made a similar commitment: a 26 to 28 percent reduction by 2025. One could sum up the world’s commitments, roughly, by saying we have a global goal of reducing emissions by 30 percent by 2030. Over that same period, however, Boeing, Airbus, and the world’s airlines will be working to increase global air travel by 100 percent. Something has to give. If the world’s airplane manufacturers, airlines, resort destinations, and tourist industry succeed in redoubling air travel, the resulting GHG emissions will contribute to massively destabilizing Earth’s climate. To meet our targets to cut GHG emissions by 30 percent in just 13 years, and by perhaps 50 percent or more by mid-century, we must ground most of the airplanes and replace them with trains powered by electricity generated from renewable, low-emission sources. If a traveler must cross the ocean, then perhaps that person should travel in a plane. But within the North American continent, within Europe, within Asia, and wherever oceans do not present a barrier, travel will have to be transferred over to fast trains. And because these trains can go from city-centre to city-centre, because trains can travel at hundreds of kms per hour, and because train journeys do not require the lengthy security checks common at airports, door-to-door travel times in trains can be less than those in planes. Citizens and travelers face a choice: keep the planes flying, continue to increase the amount we fly, increase road travel similarly, miss our emission targets by a mile, and destroy our chances of a stable, prosperous future; or invest in high-speed rail, create local jobs, and create a twenty-first century transportation system that aligns with our emission-reduction and sustainability goals. We must ground most of the global airline fleet if we want to meet our emission-reduction goals. And we must build a new system of fast trains if we want to meet our travel and quality-of-life goals. Indeed, there is no reason that the factories and technologies currently in possession of aircraft makers Boeing, Airbus, Bombardier, Embraer, and other manufactures could not be repurposed to build those trains. In the United States, federal government debt is nearly $20 trillion. That works out to about $62,000 per person, or just under $250,000 for a hypothetical family of four. Adjusted for inflation, debt has doubled since 2002, and is five times higher than in 1982. The graph above shows the increasing size of the US national debt. The time-frame is 1816 to 2016. The units are US dollars, adjusted for inflation. In the graph, some conflict periods are highlighted in a contrasting colour. Wars have caused rapid increases in government debt. Indeed, the wars in Iraq and Afghanistan (2002-2014) played significant roles in creating the unprecedented level of debt US families now must carry. Other factors include a financial meltdown and bailout, and tax cuts that eroded revenues and forced governments to fund a greater portion of their services with borrowed money. As visible in the graph, 1982 marks the beginning of the recent phase of debt expansion. That is also the beginning of the modern era of tax cutting—the implementation of the Reagan tax cuts. US citizens have enjoyed tax cuts, but have yet to pay for them. 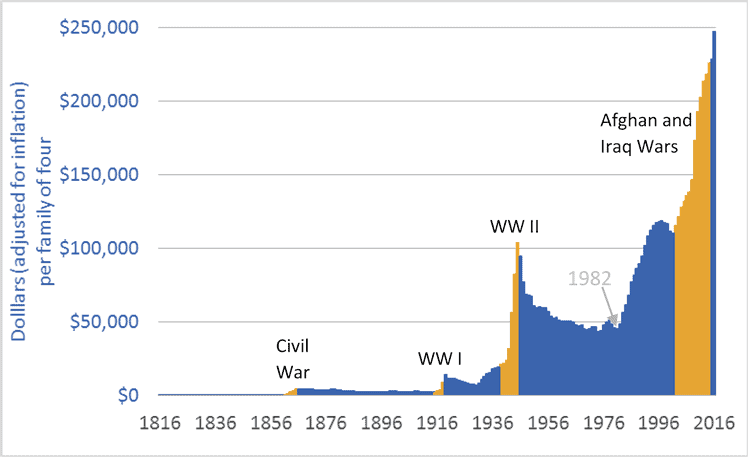 The graph shows that periods of increasing national debt (the Civil War, WW I, and WW II) were followed by periods of declining debt. The question now is this: Does the US economy retain enough vigour, and do US citizens and businesses retain enough good sense and discipline, to pay down $20 trillion in federal government debt, trillions more in personal debt, and trillions more in city, county, and state debts? It is never wise to bet against America. But de-industrialization, rising income inequality, world-leading incarceration rates, uncontrolled gun crime, Detroit and similar rustbelt cities, legislative gridlock, crumbling infrastructure, and a retreat into ideology all raise serious concerns. For comparison, Canadian national debt works out to about $80,000 (Cdn.) per hypothetical family of four. Canadians, however, must not feel in any way superior or safe, because the Canadian and US economies are so tightly tied. Rising US debt is a concern for all the world’s citizens. Last week’s blog post (Feeding the World) showed that farmers worldwide had, since 1950, quadrupled grain production. How is this possible? The answer is fertilizer; more specifically, nitrogen fertilizer. This graph shows global fertilizer use. 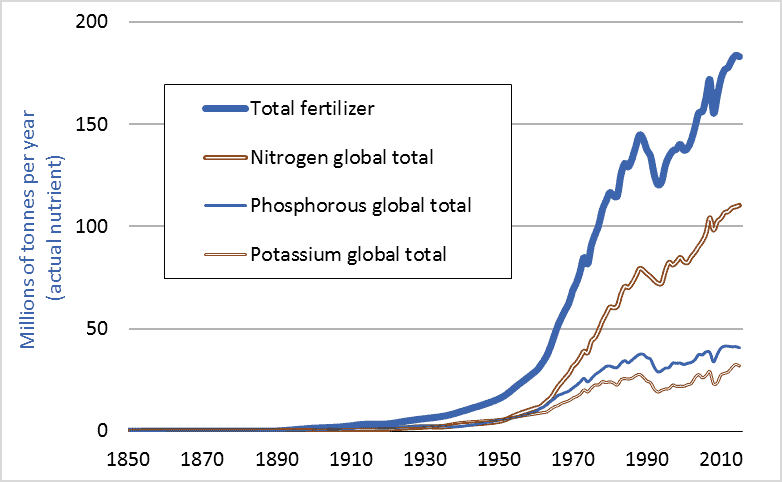 In 1950, farmers applied less than 5 million tonnes of nitrogen (measured in terms of actual nutrient, not fertilizer product). In 2015, farmers applied more than 110 million tonnes. We managed to increase grain output fourfold largely by increasing nitrogen inputs 23-fold. Nitrogen fertilizer is a fossil fuel product, made primarily from natural gas. One can think of a modern nitrogen fertilizer factory as having a large natural gas pipeline feeding into one end and a large pipe coming out the other carrying ammonia, a nitrogen-rich gas. To produce, transport, and apply one tonne of nitrogen fertilizer requires an amount of energy equal to almost two tonnes of gasoline. One reason we have been able to increase grain production fourfold since 1950, and human population threefold, is that we found a way to turn fossil fuels into plant nutrients into enlarged food supplies into us. With fertilizers, we can convert hydrocarbons into carbohydrates. Dr. Vaclav Smil is an expert on the material flows, nutrient cycles, and energy transformations that underpin natural and human systems. He believes that without the capacity to turn fossil fuels into nitrogen fertilizers into enlarged harvests, nearly half the 7.4 billion people now on Earth could not be fed and could not exist. Smil calls factory-made nitrogen “the solution to one of the key limiting factors on the growth of modern civilization.” This blog highlights the many ways humans have managed to remove the limiting factors to the growth of modern civilization. Finally, 1950 was long ago. Surely rapid increases in fertilizer consumption must have tapered off in recent years. That isn’t the case. Canadian consumption is rising especially rapidly. A look at Statistics Canada data (CANSIM 001-0069) reveals that Canadian nitrogen fertilizer consumption has increased 65 percent over the past decade (2006 to 2016). Like many countries, Canada is boosting food output by increasing the use of energy-intensive agricultural inputs. This blog post and the next (Turning fossil fuels into … food) look at the rapid expansion of our global food supply and how we’ve accomplished that feat. 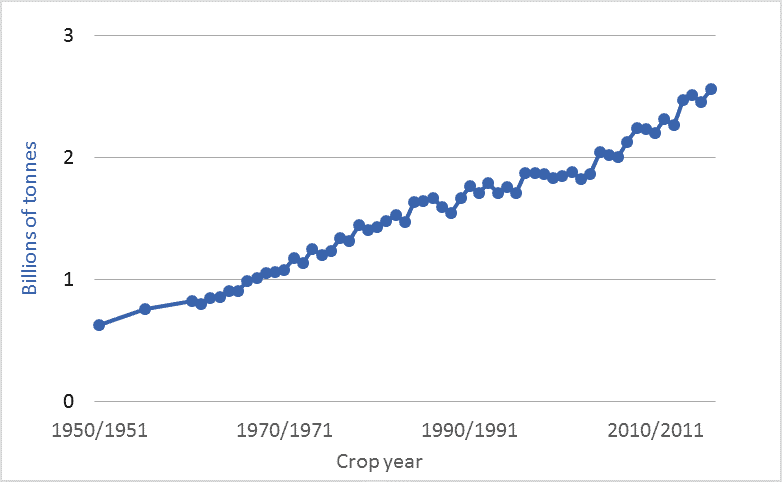 The graph above shows world grain production for the past 66 years: 1950 to 2016. The units are billions of tonnes of annual production of all grains: primarily wheat, corn, rice, barley, oats, and millet. The figures exclude oilseeds, tonnage of which is about one-fifth as large as that of grains. By utilizing ever-increasing inputs of water, machinery, fuels, chemicals, technologically-enhanced seeds, and, especially, fertilizers, the world’s farmers have managed to quadruple global grain production since 1950, and to double production since 1975. This expansion has been accomplished on a largely unchanged land area. Farmers have doubled output since the mid-’70s on a cropland area that, according to the UN’s Food and Agriculture Organization (FAO), has increased by just 5 percent. The UN projects that global human population will increase by 50 percent by the end of this century, to 11.2 billion. That enlarged population will likely be richer, on average, than today’s population. Thus, per-capita meat demand will probably rise. When we feed grains to livestock, we turn 5 to 10 grain Calories into 1 meat Calorie. Thus, diets rich in meat require higher levels of grain production. Coming on top of these drivers of increased grain consumption is the likely increase in demand for biofuels, biomass, and feedstocks for “the bioeconomy.” The Global Harvest Initiative is an industry group whose members include John Deere, Monsanto, Mosaic, and Dupont. 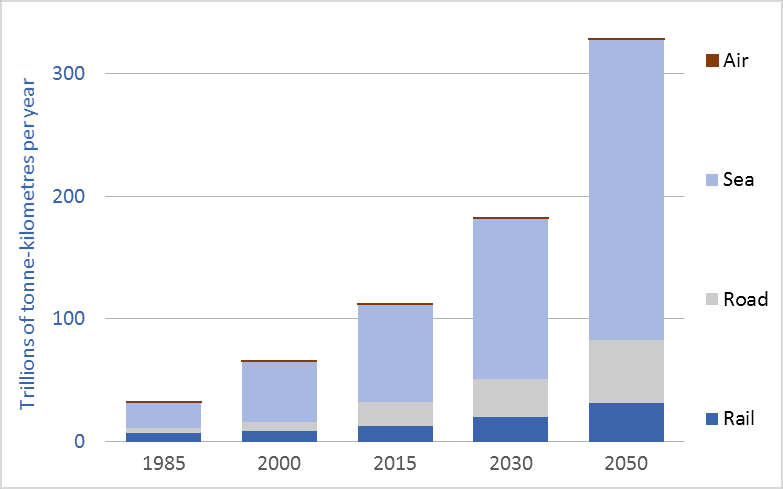 The group asserts that there is a “Global Agricultural Imperative” to “nearly double global agricultural output by 2050 to respond to a rapidly growing population and to meet the consumer demands of an expanding middle class.” If this doubling is accomplished, it will mark an 8-fold increase over 1950 production levels. Few citizens or policymakers are aware that the bounty in our supermarkets and on our tables depends upon very rapid and difficult-to-sustain rates of growth in food production. 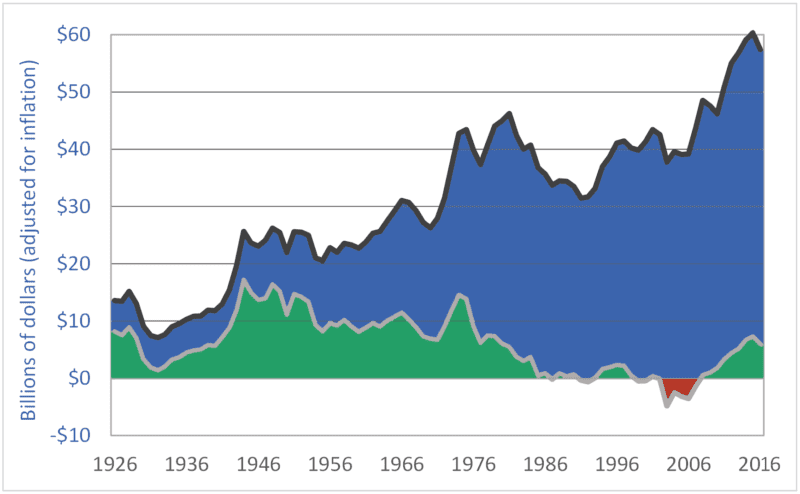 Graph sources: 1960-2016: United States Department of Agriculture (USDA) World Agricultural Supply and Demand Estimates (WASDE), ; 1950 and 1955: Lester Brown and Worldwatch Institute, various publications. Brown and Worldwatch cite USDA, “World Grain Database,” unpublished printout, 1991.